I’ve been in the photographic doldrums for a few weeks now. It seems to happen most years during mid-summer when I’m pretty busy getting stuff out into shops and creative activities tend to take a back seat. But last weekend the forecast seemed promising – sunny intervals rather than wall-to-wall sunshine – and I decided to head up to Snowdonia. I had it in mind to try out my new Panasonic gx7 and maybe do a mountain walk into the Glyderau or on to Snowdon. Early on Saturday morning I headed up into Cwm Idwal with the option of going on to the tops but conditions were really not pleasant. It was windy and cold with plenty of cloud cover. I can’t say that me and the gx7 got on like a house on fire. I hated the menu system on the gx1 and the gx7 does seem better in this respect. But it’s still not an SLR! I got a few decent images when the sun briefly shone. But after using it intermittently for about 3 hours, and taking about fourty shots, I noticed the battery power was practically down to zero. This wasn’t right at all! I spent a while looking for locations to re-visit later on, and then it was back down to the van to wait out the middle hours of the day. Cwm Idwal is a National Nature Reserve and location of many of Snowdonia’s rare arctic-alpine plant species. Sheep have been largely excluded for some years now to allow the flora to recover from the accumulated effects of countless nibbling teeth. I was very pleasantly surprised by how extensively the heather has regenerated and it was in full colourful bloom. In some ways mid-August is my favourite time of year for exactly this reason. Swathes of purple calluna are such a sensuous experience; a feast for both the eyes and the lens, and somehow more than that as well. So later on, under full cloud cover, I took my full DSLR kit up into the cwm and spent some time taking close-ups of a boggy pool and its surroundings, just heaving with wild flowers. Then it was over to the spot I had located earlier which gave a view over to Pen Yr Ole Wen. In still conditions this mountainous backdrop would be reflected in the lake. What made my location particularly special was that I could also include a gnarly old mountain ash tree, apparently growing out of bare rock, in the foreground. Unfortunately the weather was not playing ball. I made a few images, but could see that much more exciting things would be possible in better light. The next morning I was up there again and the following evening as well! Conditions were still and vast hordes of midges appeared, more than I’ve ever known anywhere in Wales. So why does this image work? Firstly I am so thrilled by the location; the rowan was a real bonus. It is probably one of only two in the Cwm – the result of many years of sheep grazing. Thirdly, the heather is in bloom. Only for a couple of weeks in the year would that be the case. Fourth, there is no wind to disturb the surface of the lake and a full reflection is visible. On the other hand, it gives such a benign impression of Llyn Idwal and its surroundings. Conditions would rarely be so amiable. So there’s definitely the place for an alternative interpretation of the location. I’ll be back. If anyone is in the mid-Wales area next week I’ll be giving the annual Halstatt Lecture at MOMA Wales, Machynlleth on Wednesday 26th at 1 pm. I’ll be talking about how I became a birder and a photographer, and finally both! Tickets are £6.00. Phone 01654 703355 for more details. My exhibition Bird/land is showing there until September 19th. Entry free of charge. To follow Tales from Wild Wales scroll right down to the bottom and click Follow. 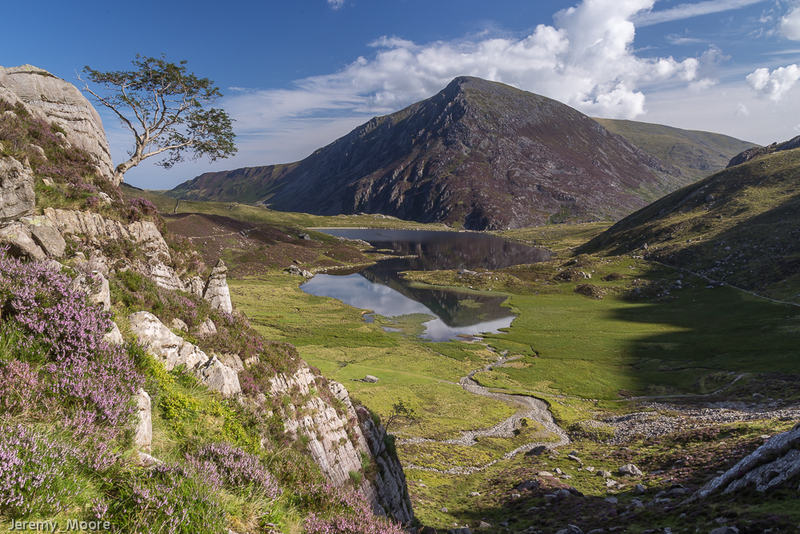 This entry was posted in Uncategorized and tagged cottage, Cwm, heather, idwal, landscape, llyn, ogwen, photography, snowdonia. Bookmark the permalink. As you know I’ve been in the creative doldrums too for a while, but the vibrant yellows and purples around at the moment do lift your spirits. 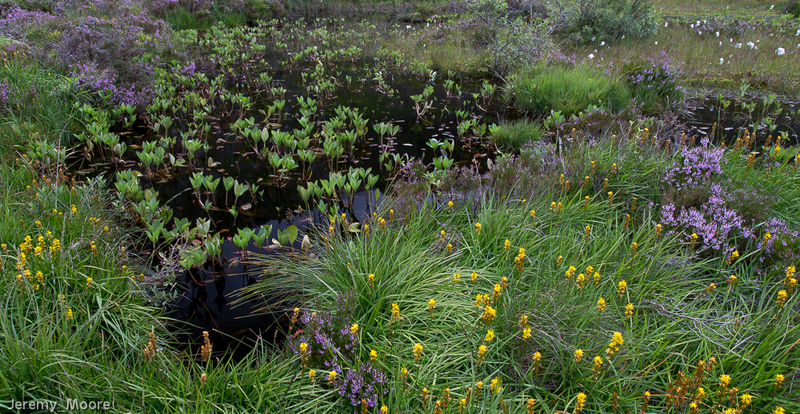 The bog pool shows them off wonderfully and that reflection is beautiful. Thanks very much Andrea. It will come…..! Like that very much, Jerry, one of Britain’s fave views it has to be. Hope you get back soon for the alternatives.